I fell in love with Michael Wacha's pitching mechanics due to his spectacularly efficient core; a core that is an almost perfect clone of Justin Verlander's. 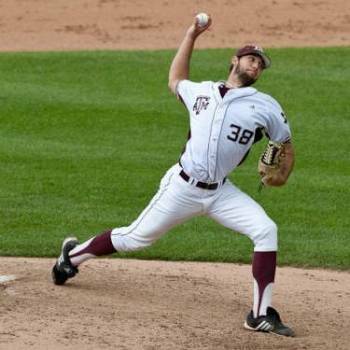 However, as time went by, and Michael Wacha's velocity went up relative to his days at Texas A&M, I noticed something; his arm was getting later and later and his Timing was getting worse and worse. Now, when I look at Michael Wacha, I still see that spectactularly efficient core but I also see a hugley problematic movement pattern that I call Flat Arm Syndrome and that makes me relatively pessimistic about his future prospects. If you follow my work, you know that I had -- and to a degree still have -- a high opinion of Cardinals pitcher Michael Wacha. He possesses many of the characteristics that I look for in a pitcher; athleticism, efficiency, etc. 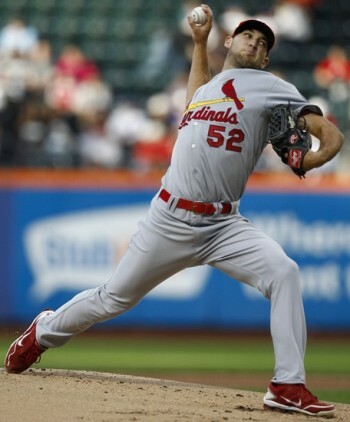 For instance, this picture of Michael Wacha is pure gorgeousity. 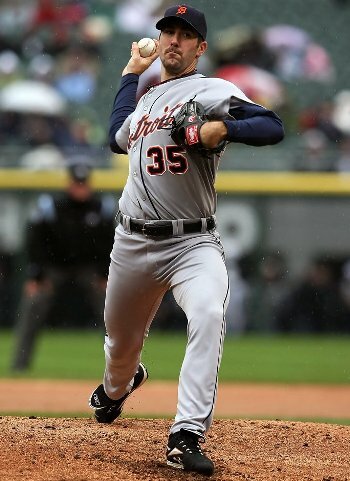 It's also pretty much functionally identical to one of my favorite pictures of Justin Verlander, one of my favorite pitchers. As a result, I was surprised when Michael Wacha went down with a stress reaction in his scapula. I think the answer to that question is tied into a concept that many people in and around baseball throw around but that I believe is becoming increasingly problematic. 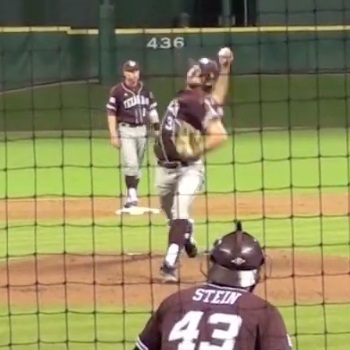 If you listen to scouts enough, one word that you will hear tossed around a lot is the word, "Projectable." Essentially, when a scout says a player is projectable, it means that player has room for significant improvement. For hitters, that often means that they have the potential to hit for more power in the major leagues. For pitchers, that generally means that they have the potential to throw harder than they currently do. On the one hand, I get the concept of projectability; many people have room for improvement. Their mechanics aren't perfect and you can see things that, if cleaned up, could help them achieve a higher level of performance. I have direct knowledge of this problem. 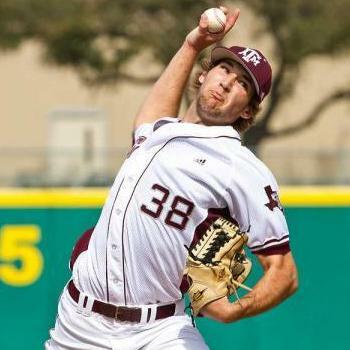 A year or so a client of mine, an affiliated minor league, left-handed pitcher who can throw 90 to 91 was told by his coaches that by learning to make the Inverted W, he could pick up a few more miles per hour. The problem is that my client was not informed of the risks of making such a change, just the benefits. 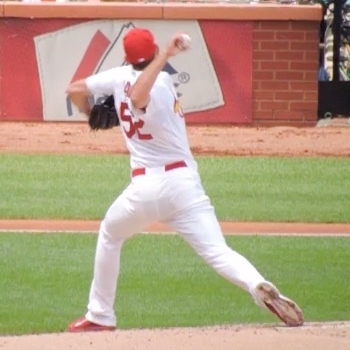 In the case of Michael Wacha, the primary trick that he seems to be employing is Scapular Loading, although I also see some suggestion that he may also be trying to Show the Ball to Center Field. Regardless of exactly which trick(s) Michael Wacha is employing, I have found that, under certain circumstances, his arm is getting into a problematic position. I believe that is contributing to the overloading of the muscles that attach to his scapula and creating the stress reaction that he is experiencing. The scouting reports I've read on Michael Wacha in college put his fastball the 90-94 range in college. Yes, some people had him toppping out at 95 or 96, but touching 96 in a bullpen isn't the same as sitting 96 in a game. The video clips that I have seen of Michael Wacha pitching in college do not show any signs of a timing or other problem. Instead, I see everything that I look for in a prospect and rated Michael Wacha very highly as a result. The same is true of the few still images that I have been able to find. What you see is an arm that is up and in a good position at foot strike. You also see the telltales of mechanical efficiency. The first hint of a problem with Michael Wacha's pitching mechanics came during the World Series. During one of the broadcasts, they showed some high speed footage of Michael Wacha throwing a pitch. This clip is problematic for two reasons. First, this clip is stripped of context; you don't know what pitch this was or how hard it was thrown. Second, although it doesn't show Michael Wacha's feet, if you look at this clip closely, you will see hints of a timing problem. The thing to notice is the position of Michael Wacha's arm when his hips start rotating. Although it's hard to judge precisely, because you can't see Michael Wacha's feet, I'd estimate that his hips start rotating in Frame 32. That is a problem because only a few frames earlier, in Frame 29, Michael Wacha is at the point of maximum scapular load and his pitching arm is at roughly zero degrees of external rotation and perpendicular to his spine. 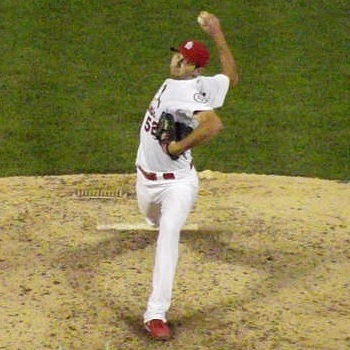 Three frames isn't enough time for Michael Wacha's pitching arm to externally rotate 90 degrees. As a result, his arm externally rotates up and back while his hips and shoulders rotate. That will tend to put more load on his elbow and shoulder. So is His Timing Good or Bad? ...you can find another picture of him in a good position, with his arm at roughly 90 degrees of external rotation at foot plant. I initially believed that what I was seeing were just two different moments in time during the same delivery; that Michael Wacha was just very good at holding his shoudlers back in order to give his arm time to get up. 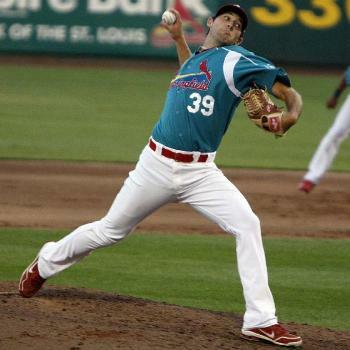 However, Michael Wacha's problems with his scapula made me re-evaluate things. That helped me discover something that I believe that is causing Michael Wacha's timing to vary and that is contributing to his shoulder problems. During early 2014, pretty much right from the start of the year, I started to see what looked like some variability in Michael Wacha's timing. In some clips, and when throwing some pitches, he would look fine. However, in other cases he looked a bit off. "I was able to go back there and look at the film there in the fourth inning," Wacha said. "Mechanically there my arm was dragging, forcing me to yank the ball. I wasn't really in sync there." His comments have all of the hallmarks of someone who is struggling with a timing problem. As a result, I made a point of going to every start that Michael Wacha threw and tried to film him from multiple angles and, more importantly, correlating those clips with Pitchf/x data. On May 15, 2014, I hit what I later found was paydirt. I was playing around with a new camera -- a high speed camera with a big zoom lens -- and managed to capture the following sequence of images. 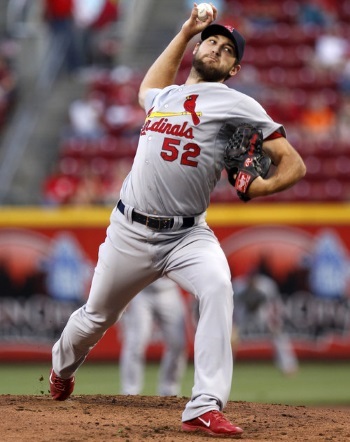 The thing to notice is that, as he throws harder, Michael Wacha's degree of scapular loading (retraction) increases and his external rotation decreases (his arm is flatter at the same moment in time). If you compare the two pictures directly above, you will notice how you can see much less of Michael Wacha's name on the back of his jersey. What you are seeing is an extreme retraction and elevation of the scapula as well as a greater degree of internal rotation; what I call Flat Arm Syndrome, caused by the Horizontal W.
The bottom line is that I believe that Michael Wacha is over-throwing. By trying to create more velocity, Michael Wacha is putting his body, and especially his arm and his scapula, in a problematic position. You can see this same problematic position in the frame below, which shows Michael Wacha throwing the pitch that cost him a no-hitter with two outs in the ninth inning. 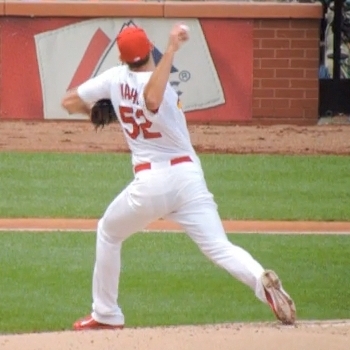 In an effort to blow the hitter away with a 97MPH fastball, Michael Wacha has kept his arm back such that his arm is only externally rotated 30 to 45 degrees at the moment that his front foot plants and his hips and shoulders start to rotate. I don't know what Michael Wacha has been taught and why he is doing what he is doing. However, I do know that what Michael Wacha is doing is something that I have come across before. It is called Scapular Loading and it's a popular and effective, but potentially problematic, way of giving a pitcher a velocity boost. Maybe Michael Wacha is scap loading because he's been taught to do it and maybe he just does it naturally because it helps him throw extra hard. Regardless, when he scap loads in an effort to take his velocity to 11, he is pushing his body beyond its current capabilities. It would be worth it to compare when and how Michael Wacha scap loads to how hard throwers like Nolan Ryan and Randy Johnson (and Trevor Rosenthal) scap loaded and look for differences that might be significant. I have heard some talk about how Michael Wacha is using his change-up less often. I'm not sure if that is true or what the motivation is, but I do need to address a misconception. I have heard people say that the change-up is problematic because the resulting pronation can overload the shoulder. I am skeptical about these claims because in The Epidemic I have identified a number of Killer Cues that I believe do a better job of identifying why pitchers are getting injured. There's also the fact that a good change-up is thrown exactly the same as the fastball. Generally, the arm action is the same and the only difference is the grip. Given that Michael Wacha's change-up is regarded as a plus or even plus plus pitch, what I could buy is that he is throwing it too much like his (hard) fastball; that when he throws a change-up, he does so using his (problematic) 97 MPH arm action. It could even be the case that Michael Wacha is throwing his change-up with an even faster arm action -- as he would when throwing a 100 MPH fastball -- than his fastball. However, again the problem is the 97+ MPH arm action, and the scapular loading, not the change-up grip. Brandon McCarthy's name is often brought up in the context of Michael Wacha because they both have had the same rare problem. As it turns out, I am deeply familiar with Brandon McCarthy's pitching mechanics because I have discussed Brandon McCarthy's pitching mechanics a number of times with him over the years. While their stories are different, I believe that there are things that helped Brandon McCarthy that could also help Michael Wacha. If I ran the zoo and/or could talk to Michael Wacha for 15 minutes, I'd tell him that first and foremost he needs to stop over-throwing. His velocity is what it is right now. Combine that with his already excellent change-up and a developing curveball and he has all of the tools that he needs to be successful in the short term. If Michael Wacha is still interested in boosting his velocity, there are ways of eking out additional velocity. However, scap loading is not the answer for Michael Wacha as his scap stress reaction is making clear. 1. Mariano Rivera had the same experience as Michael Wacha when he first came up. The Yankees tried to turn him into a 95-96 MPH power pitcher, as opposed to the 92-93 MPH pitcher that he was, and he got hurt as a result. Mariano Rivera could only stay healthy by focusing on command and movement, not maximum velocity.